“In the Heights” follows on the heels of Ms. Didier’s last directorial project at Porchlight, “Dreamgirls” which also enjoyed a very successful run. “Dreamgirls” was recently the recipient of 2016 Equity Jeff Awards for Production-Musical (for a midsize theatre), Principal Actress (Donica Lynn), Supporting Actor (Eric Lewis) and Costume Designer (Bill Morey) and received Jeff nominations for Director – Musical and Musical Direction. If you missed Ms. Didier’s “Dreamgirls” project, be sure to check out the heartfelt and energetic production of “In the Heights”. All performances are at Stage 773 located at 1225 West Belmont Avenue in Chicago. Show times are Thursdays at 7:30pm, Fridays at 8pm, Saturdays at 4pm and 8pm, and Sundays at 2pm. Tickets can be purchased at PorchlightMusicTheatre.org. To contact Porchlight’s Box Office, call 773-327-5252. Pride and Praise for our LAD Performance and Hip Hop Companies! 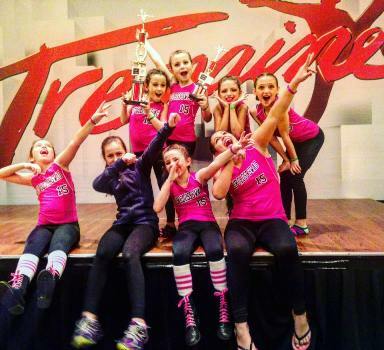 Lincolnshire Academy of Dance’s Performance Company (LADPC) and Hip Hop Company finished off their competition season this weekend at Tremaine Dance Convention in Chicago on a high note! After many classes and numerous rehearsals, the hard work of our company dancers, Company Manager and Director, Deborah Silvers, Company Director, Mary Tisa, and choreographers and commitment of our LAD parents paid off. The Hip Hop Company whose number “Lip Gloss” was choreographed and rehearsed by LAD Hip Hop instructor, Nicki Niemet, won First Place and overall highest score in the Junior Division. Our Hip Hop Company members are Olivia and Isabel Bottcher, Tess Freemen, Eva Nikolic, Isabel Perez, Calleigh Schneider, Anett Vaysberg and Karina Dyakov (Apprentice). Lincolnshire Academy of Dance Performance Company’s Group numbers won 2nd Place for Musical Theater with “Footloose” choreographed by LAD instructor, Sasha Vargas, and for Lyrical with “Step by Step” choreographed by LAD instructor and Company Director, Mary Tisa. The company’s small group pieces also received awards. 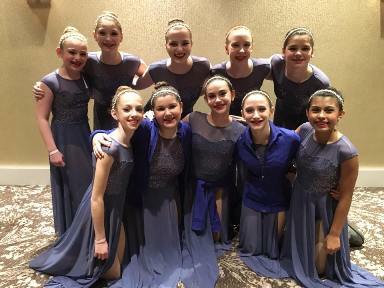 The Tap trio’s “Hollywood” dance choreographed by LAD instructor, Christie Kerr, won 3rd place, and the quartet’s Lyrical piece, “The Promise” choreographed by Mary Tisa was also awarded 2nd place. Although Tremain only gives award for 1st – 3rd place, we would be remiss if we didn’t acknowledge that the Jazz duet “Move” choreographed by LAD instructor and Giordano Dance company member, Ashley Downs, received 4th place. The Performance Company members are Agnes Chamberlain, Ryan Cheslock, Megan Embree, Kelly Fagel, Elli Freeman, Ashley Gordon, Raquel Hirsch, Ty Melnick, Sarah Rainis, and Ella Van Gerven. Look for more performances by the Lincolnshire Academy of Dance Performance Company and Hip Hop Company in our recitals June 11th and 12th at the Stevenson High School Auditorium and in the upcoming months throughout our local community. or get the latest updates by email.